We’d love your help. 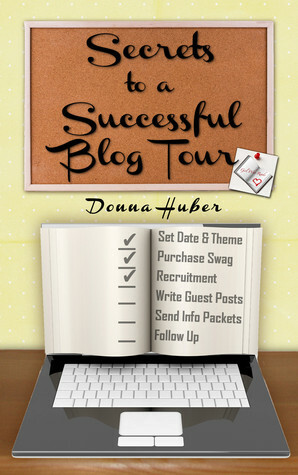 Let us know what’s wrong with this preview of Secrets to a Successful Blog Tour by Donna Huber. *Diffe From the publicist who introduced the world to Fifty Shades of Grey, Donna Huber is now revealing her secrets to successful blog tours. She shares tips and tricks learned through organizing over 30 tours, blasts, and promotional events for nearly 50 independently and traditionally published titles. To ask other readers questions about Secrets to a Successful Blog Tour, please sign up. I have been waiting for this guide with baited breath because I run an author image service, run book tours for them and work with a lot of authors as a helpful hand who do not have the funds to hire PR on even a part time basis. This guide was needed. She has talked about many of the information in this how-to piece on her blog as part of her Thursday Tipe feature posts. BUT what she did here was expand upon it and give a step-by-step easy to follow guide, and even used pictures! (Yes I am visu I have been waiting for this guide with baited breath because I run an author image service, run book tours for them and work with a lot of authors as a helpful hand who do not have the funds to hire PR on even a part time basis. This guide was needed. She has talked about many of the information in this how-to piece on her blog as part of her Thursday Tipe feature posts. BUT what she did here was expand upon it and give a step-by-step easy to follow guide, and even used pictures! (Yes I am visual, I love photos). It is laid out in steps, and in the end it even has a set of nice checklists to use as an example or even just use as is. For those of us who take a zen approach and have the organizational skills of a squirrel before winter, this is wonderful. I run tours and I found after reading it for my third time even more info. I do things differently with some of these things but have found a bunch of things that will end up saving myself and the authors time, stress and money. Everything here is useful, there isn't one poor example of how to run part of a Tour. I have been part of her blog tours as a blogger and she is in the top three of who I would grade an A because of how smoothly they are run. It's my book so of course I think it is fantastic. I have to say how excited I was when I saw the title of this book. Even though I am the marketing guru for my publishing company, the idea of organizing a successful blog tour on my own was overwhelming. One thing that's my biggest pet peeve is not having good time management. I couldn't for the life of me figure out how to best organize the number of blogs that signed up to host our titles. I tried excel spreadsheets and day planners to keep up with everything, yet I kept feeling like the whole I have to say how excited I was when I saw the title of this book. Even though I am the marketing guru for my publishing company, the idea of organizing a successful blog tour on my own was overwhelming. One thing that's my biggest pet peeve is not having good time management. I couldn't for the life of me figure out how to best organize the number of blogs that signed up to host our titles. I tried excel spreadsheets and day planners to keep up with everything, yet I kept feeling like the whole process was taking up too much of my valuable time. When I saw a Facebook post about this book, I immediately purchased it on Amazon in hopes that I'd find the secret key to save me time. Sure enough I did! I started using the Google Forms that the author recommends to book my tours and it has made my life soooooo much easier. There are so many other amazing trinkets of advice in this quick read too. Also, another thing that majorly appealed to me was that it was a quick read. The author states that you will most likely have it read in an hour. Some may say that an hour's worth of reading isn't worth the value, and perhaps it's not if you are looking for an awesome fiction story, but when it comes to facts and how to's, an hour was perfect! It was written simply, no over complicated wording, just good old fashioned tips that will put you ahead in the blog tour game. First things first: This book, at less than one dollar, is a must purchase for every author who is responsible for their own marketing. Second: The book is LOADED down with critical information for managing successful blog tours at each and every level of the tour. This is backed up with lists at the end of the book. On that note, this book would have been a 5 star review for me had the author used methods to make critical information stand out, such as bullet points and bold print. Furthermore, First things first: This book, at less than one dollar, is a must purchase for every author who is responsible for their own marketing. Second: The book is LOADED down with critical information for managing successful blog tours at each and every level of the tour. This is backed up with lists at the end of the book. On that note, this book would have been a 5 star review for me had the author used methods to make critical information stand out, such as bullet points and bold print. Furthermore, as someone who has read and/or reviewed several hundred business books, one thing that makes a business book stand out is conciseness in presentation. Having critical information at the drop of a finger is critical to efficiency. The greater majority of the book was written in a novel format. This made the information difficult to pull out or difficult to recall. Since this book is available as an ebook, this would make that process even more difficult. Even though I read this a while ago I didn’t even think of giving this kind of book a review. How silly of me because I know a lot of hard work went into gathering all this pertinent information. The ideas that were shared on these pages were extremely helpful. It is done in such a clear and precise way with laid out steps that really helped. I loved all the examples too. I appreciate the suggestions in this handy book and have already used some of the great marketing ideas. This book has very us Even though I read this a while ago I didn’t even think of giving this kind of book a review. How silly of me because I know a lot of hard work went into gathering all this pertinent information. The ideas that were shared on these pages were extremely helpful. It is done in such a clear and precise way with laid out steps that really helped. I loved all the examples too. I appreciate the suggestions in this handy book and have already used some of the great marketing ideas. This book has very useful concepts that are easy to organize. I found it simple to understand and comprehend. I can be a bit slow with new things but this book was not at all complicated. There are so many useful tips. I will keep this book close by for my next blog tour. In Secrets to a Successful Blog Tour, PR expert, Donna Huber, provides pages of invaluable information for every author looking to both set up their own tour or learn more about hiring a tour company to run a tour on their behalf. Donna brings years of experience to the table, sharing tips in an organized and easy to follow manner. Donna gives great examples from her own experiences, ranging from working with traditionally published authors to self-published authors, giving the reader confidence In Secrets to a Successful Blog Tour, PR expert, Donna Huber, provides pages of invaluable information for every author looking to both set up their own tour or learn more about hiring a tour company to run a tour on their behalf. Donna brings years of experience to the table, sharing tips in an organized and easy to follow manner. Donna gives great examples from her own experiences, ranging from working with traditionally published authors to self-published authors, giving the reader confidence in Donna's results. This is a must have reference guide for every author. As a blogger, rather than an author, I found the book to be eye-opening as far as the preparations and work that go into creating a successful tour. I did not realize how far in advance planning needed to start and what steps needed to be taken before bloggers even start signing up to host an author. This book is such a little gem! It's quick and easy to read, yet jam packed with so many helpful hints. All the advice is laid out in easy to find sections and everything is explained concisely. Really, I wish this book was around when I first started participating in blog tours, it would have saved me a LOT of leg room! Well done Donna for bringing all this information together in the once spot! I'm helping a friend with publicity for her book, and although we're not doing an actual tour, the information in this book is so easy to understand, that setting up a tour would be so much smoother with this book to guide us. There is still a lot of great information for anyone looking to publicize their book. If you are a self-published author looking for ways to promote your new book, this is a must read. It is full of helpful tips on exactly how to organize your very own book tour, how to find bloggers to help you do a book tour and a ton of resources. I found it very helpful indeed. I wish I had read this book BEFORE I organized my own blog tour. It would have saved me a ton of time. I liked that the book was short and provides information concisely. Will be recommending to my author friends. Secrets to a Successful Blog Tour was a great little read. It had everything a novice author would need to know to understand and manage a blog tour. I highly recommend it to any novice author. I especially enjoyed the tone. I felt Donna Huber was speaking to me directly and giving me advice that made sense and more importantly that I could understand and accomplish. Well done, Donna.